This section covers the Goods Yard and Engine Shed area, south of the city centre. After the closure of the railway the north end of the freight yard, including the goods shed, had been largely taken over by British Road Services and its successors. The central and southern parts of the site came to be dominated by the large Vic Berry’s scrap yard. This maintained its rail link with the Leicester to Burton line and received such large quantities of railway rolling stock for scrap that they much was piled in the famous stacks until it could be cut up. Following a disastrous fire in one of these stacks involving stock which may have contained asbestos the scrap yard closed down in the early 1990s. In a corner at the south end of the goods yard site, next to Upperton Road, was the much smaller scrap yards of Frank Berry and A.E. Piggott & Sons which cut up general scrap. The Piggott yard continued to operate for a few years after the closure of Vic Berry’s yard. For many years it had sent nothing out by rail, but in a surprise move in the mid 1990s it sent scrap by rail to South Wales for a few years. These were the last trains to leave the old Great Central line in Leicester. 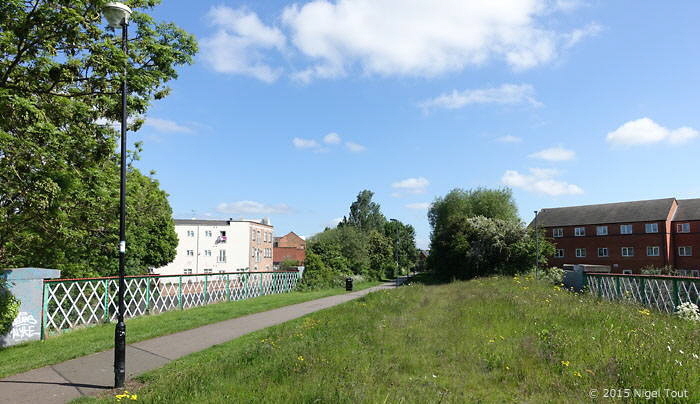 This area, known as Bede Island, has been completely redeveloped from the late 1990s and office units and housing cover the site of the goods yard and subsequent scrap yards. There is also nothing to see of the carriage shed which was to the west of the main line and bounded by a bend in the Old River Soar. 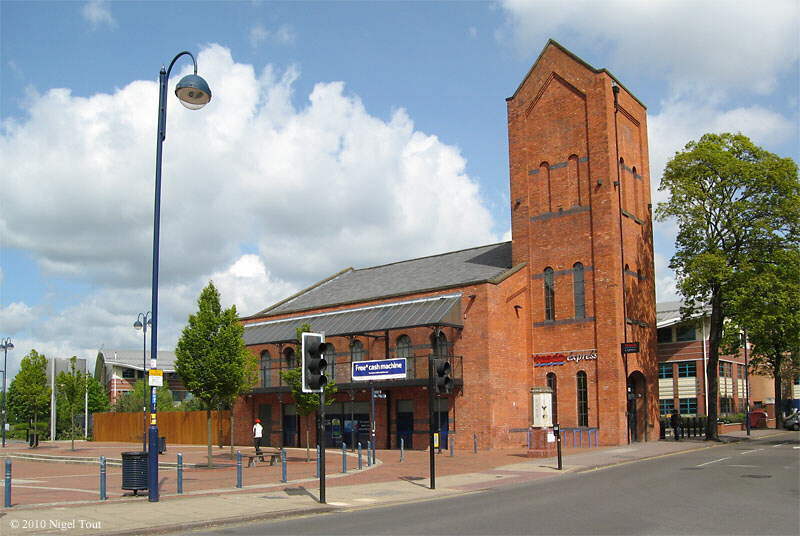 Leicester Great Central engine shed was south of Upperton Road, near to the Leicester to Burton railway line. Again, there is nothing to see of the shed as this whole area has been redeveloped too. The sole surviving Great Central building of the goods yard is, surprisingly, the electricity generator and hydraulic power house, on the east of the goods yard site alongside Western Boulevard. Although there were other better looking buildings, such as the goods offices, this has been retained and was converted, first into the “Quay” pub, and then in April 2010 into a Tesco Metro store, shown here. The freight yard originally made extensive use of hydraulic power, including hydraulic capstans for moving wagons by rope. At the south end of the goods yard site the Great Central Way continues south across the bridge over the Old River Soar, which was reconditioned in Spring 2009. This view used to be dominated by Upperton Road viaduct, which was demolished in 2007 (see the Old Photographs: Demolition section) and Upperton Road is now crossed on the flat. The brick building just visible on the left is the former Great Central Railway wagon repair shop which still exists but in other use (see photographs below). Looking north at the bridge over the Old River Soar with the Great Central Way following the trackbed of the Great Central main line. On the right houses and industrial units have been built on the site of the goods yard, which had later become scrapyards. 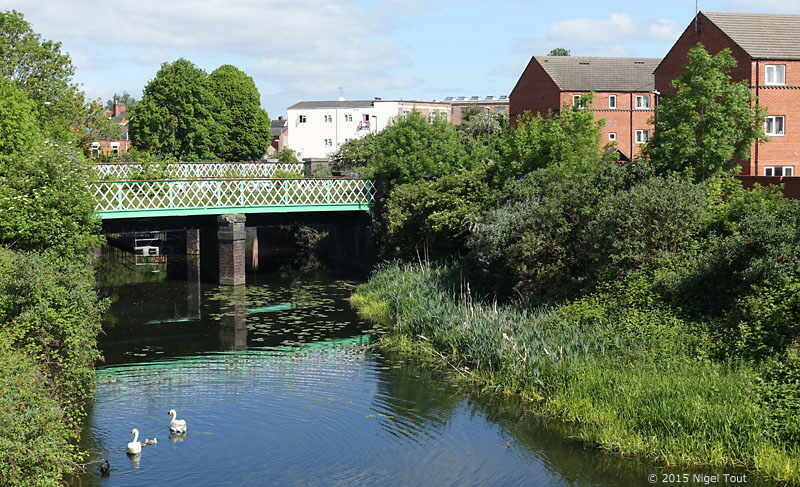 To the side of the reconditioned bridge taking the Great Central Way over the Old River Soar is one of the bridges which gave rail access to the goods yard, where the houses have now been built. Upperton Road passed over the Great Central main line here on a viaduct, but this has now been leveled. The Great Central Way foot and cycle path, which follows the track bed, crosses at the pedestrian crossing. 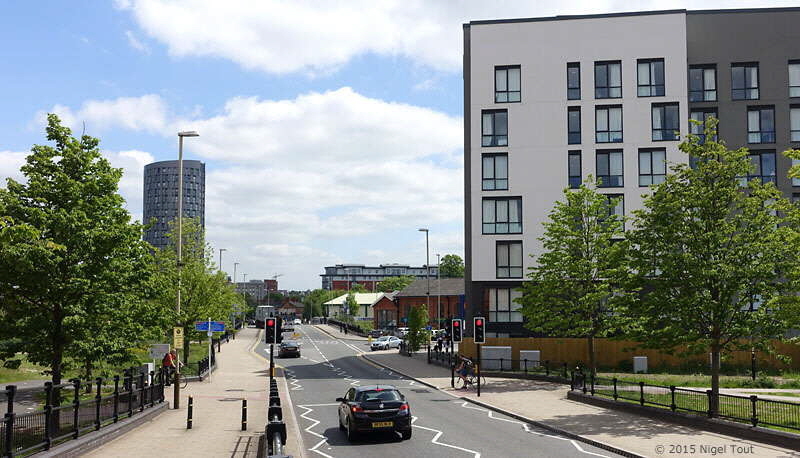 The student accommodation block on the right was built in 2011 at the place where the fan of lines entered the goods yard, which was on the left, and is partially hiding the former Great Central wagon repair shop. The former Great Central Railway wagon repair shop has been smartly modified (see photograph below). Evans Cycles store now occupies the left end of the building. Previously this building was overshadowed on the left by Upperton Road viaduct, but this has now been leveled. The former Great Central Railway wagon repair shop, before modernisation when in industrial use. 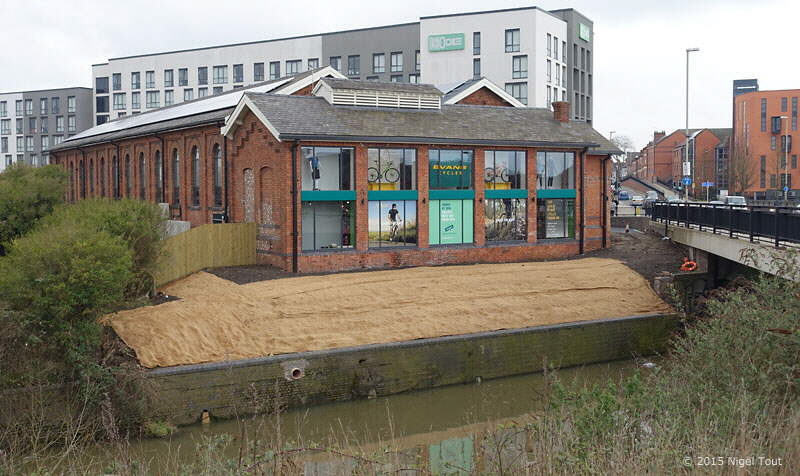 Another view of the ex-Great Central Railway wagon repair shop, with the Old River Soar in the foreground. The building has been modified (see photograph below) and now accommodates Evans Cycles store. Upperton Road viaduct was on the right, and its leveling required the construction of the new concrete bridge. 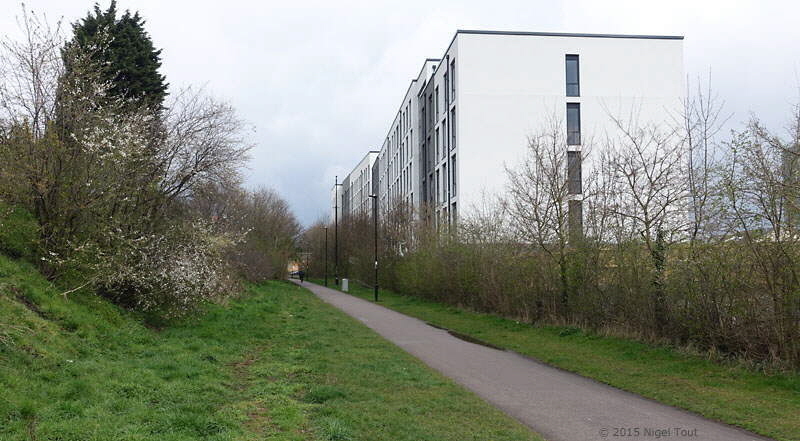 The white building is a new student accommodation block, which has been built on part of the GC trackbed. The ex-Great Central Railway wagon repair shop before it was modernised, for comparison with the previous photograph. Looking northwards along the Great Central Way just after crossing Upperton Road. The pathway covers the track bed of the main line while the student accommodation block has been built over the goods loop, sidings, and tracks to the engine shed. To the south of Upperton Road the track bed of the chord up to the Leicester to Burton branch of the Midland Railway can still be seen, complete with a few railway artefacts like the sleeper on the left. This chord was used in the final years to give trains access to the scrap yards on the site of the former goods yard. Here, looking south, the Great Central Way is behind the hedge on the right. A temporary chord in a similar location was actually used during the construction of the GCR. A photograph of it from the Newton Collection can be seen at http://www.transportarchive.org.uk/getsingleobject.php?rnum=L1720 when the surroundings were much more rural. “The Midland Railway: A Chronology” gives the opening date as April 1965. Leicester Central engine shed was situated alongside the chord but all signs of it have been eradicated in the Bede Island redevelopment. 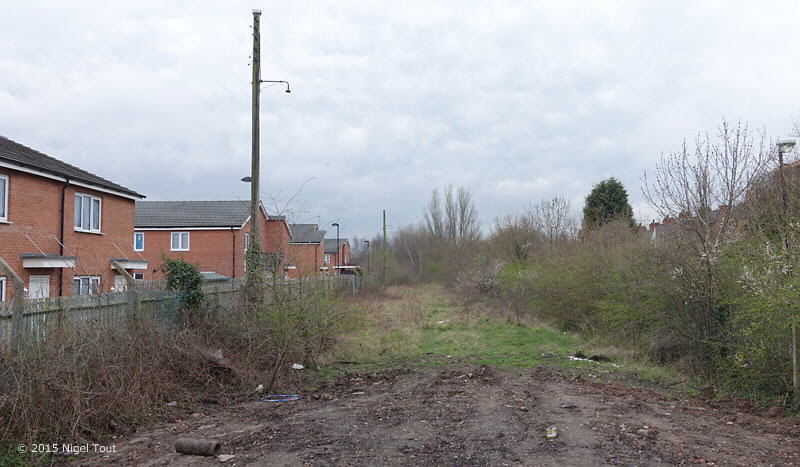 In this view from April 2008 the far mound of earth is approximately over the site of the shed, while beyond is the Walkers Stadium (now King Power Stadium), the home of Leicester City football club.